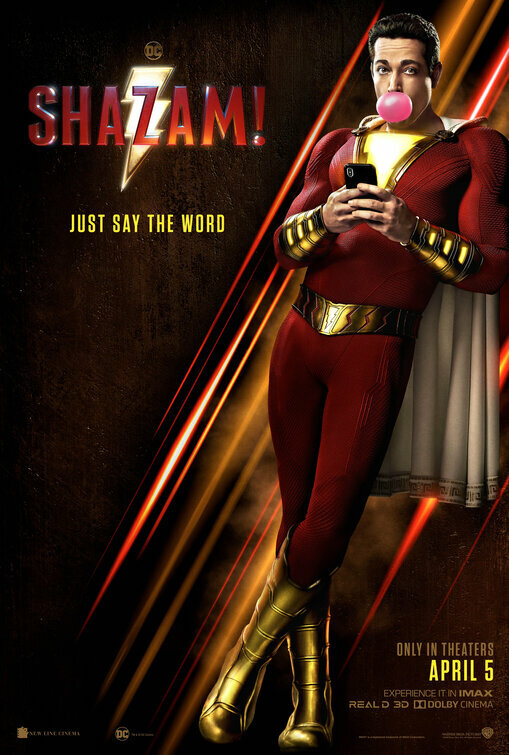 FILM REVIEW – SHAZAM! With Zachary Levi, Mark Strong, Asher Angel, Jack Dylan Grazer, Djimon Hounsou. Written by Henry Gayden. Directed by David F. Sandberg. Rated PG-13 for intense sequences of action, language, and suggestive material. 132 minutes. For those new to the mythology, Billy Batson (Asher Angel) is a fourteen-year-old kid who keeps running away from foster homes. One day he finds himself meeting a wizard (Djimon Hounsou) who transfers his amazing powers to him. When he says “Shazam!” – standing for the powers of Solomon, Hercules, Atlas, Zeus, Achilles, and Mercury – he is transformed into an adult superhero. Much of the story is how his adult incarnation (Zachary Levi) discovers his powers and figures out what to do with them, getting help from fellow foster child Freddy (Jack Dylan Grazer) who is obsessed with superheroes. A lot of the things he does are irresponsible and even dangerous, as one might expect from a young teen given limitless power. Slowly, he comes to realize what is important – which is to say, he matures – overcoming his own sad backstory. The villain here is Dr. Thaddeus Sivana (Mark Strong), who had the opportunity to take on this role as a kid but proved to be unworthy. Now empowered by embodiments of the “seven deadly sins,” he wants Billy’s powers as well. The tension between them plays out as Sivana is now an actual adult while Billy is only a kid in an adult superhero’s body. Although arguably too long at 132 minutes (as these superhero movies tend to be), it is an entertaining and action-packed romp that may be one of the best of the DC universe movies. (DC acquired the rights to the character when they prevailed in the Superman copyright suit.) It has genuinely touching character moments, as when Billy reconnects with his mother (Caroline Palmer), as well as a knowing take on the insecurities of adolescence.